Synthetic peptide corresponding to Human Carbonic Anhydrase IX aa 359-459. Our Abpromise guarantee covers the use of ab15086 in the following tested applications. IHC-Fr Use at an assay dependent concentration. PubMed: 20515941Slides were fixed in acetone for 20 minutes. WB Use a concentration of 1 µg/ml. Detects a band of approximately 55 kDa (predicted molecular weight: 49.7 kDa).Can be blocked with Recombinant Human RND1 protein (ab109840). Expressed primarily in carcinoma cells lines. Expression is restricted to very few normal tissues and the most abundant expression is found in the epithelial cells of gastric mucosa. Contains 1 alpha-carbonic anhydrase domain. Asn-346 bears high-mannose type glycan structures. Nucleus. Nucleus, nucleolus. Cell membrane. Cell projection, microvillus membrane. Found on the surface microvilli and in the nucleus, particularly in nucleolus. Formaldehyde fixed, PBS/ 0.3% Triton X-100 permeabilized frozen human colorectal tumor tissue stained for Carbonic Anhydrase IX using ab15086 (green) at a 1/1000 dilution. 5% serum used for blocking for 1 hour at RT. Primary incubation time 3 hours at RT in PBS/ 0.3% Triton X-100/ 1% BSA. Secondary: Goat polyclonal conjugated to AlexaFluor® 488 used at a 1/2000 dilution. ab15086 at 1/500 staining dog gastric mucosa tissue sections by IHC-P. The tissue was formaldehyde fixed and a standard citrate buffer was used for anitgen retrieval. The tissue was blocked with 10% serum prior to incubation with the antibody for 15 hours. A biotinylated donkey anti-rabbit IgG (H + L) was used as the secondary. Publishing research using ab15086? Please let us know so that we can cite the reference in this datasheet. We have several HIF antibodies in our catalog that react with mouse. For example, ab8366: HIF1 alpha, ab199: HIF2 alpha, ab10134: HIF3 alpha, ab465: HIF1 beta. If you could let me know which HIF you are looking for and what application it would be used for, I would be happy to help you narrow down the results. While we do not have any antibodies to Carbonic Anhydrase IX that are known to react with mouse, the antibodies ab108351 and ab15086 are likely to show some cross-reactivity due to sequence homology. If you would like to test either of these antibodies for use in mouse, I would be happy to offer you our 100% testing discount program. If you purchase the antibody for full price and submit an Abreview with your mouse results, you will receive a discount code that can be redeemed for a free primary antibody on a future order. Thank you for contacting us. Unfortunately we do not have any kit corresponding to the detection of the CAIX protein. However, I would suggest to develop an ELISA assay using the CAIX protein ab114200 that would be coated on the plate. A control anti-CAIX, such as ab15086, for which the concentration is known, may be used to create a standard curve and to quantify the amount of anti-CAIX antibodies contained in the mouse sera. ab15086 is a rabbit antibody. 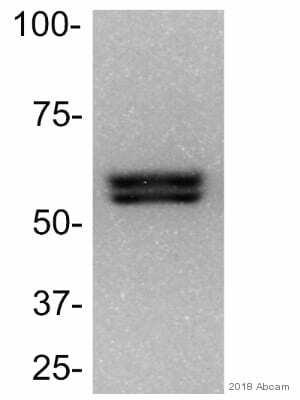 A mouse antibody would ideal, unfortunately, the only mouse anti-CAIX we have (ab107257) is not purified. It is an ascites surpernatant and the concentration has therefore not been determined. I hope this information is helpful to you. Please do not hesitate to contact us if you need any more advice or information. Thank you for your patient. Unfortunately there is no number that I can provide to you as it is impossible to know for sure how many slides you will be able to stain with a vial. This will depend on the experimental conditions, the samples and how highly expressed the protein is, and what dilution you end up choosing. This antibody is recommended to be used at a 1:1000 dilution for IHC staining as this has worked well for our lab. I would recommend ordering a single vial and test it to determine what amount will be best for your assay rather than order too much or too little without first working with the antibody. The price for a single vial is €370.00 (without shipping costs). For more information about prices and shipping conditions, please contact our Customer Service department at: orders@abcam.com Regarding your second question, we haven’t tested this system in our lab, so I cannot assure whether it will work. However, it has a fairly normal range pH in the buffer (7-8) so most likely the functions best around that range and not at a high pH. I hope this information is helpful. Please do not hesitate to contact us if you need further advice or information. Thank you for contacting us. The concentration which is recommended for performing IHC-P with Anti-Carbonic Anhydrase IX antibody (ab15086) is 1/1000-1/2000. Taking the more concentrated range, I have estimated that from the 100µl provided (and incubating with using 200 µl of diluted antibody per slide) a total of 500 slides could be stained. For 150 slides this would equate to a total of 30µl of the vial used. This is only an estimate and optimization with the individual tissue would need to be done. In answer to your second question, although we have not tested our antibodies using the EnVision Flex+ visualization System, from having reviewed the product I seen no reason why it would not be compatible. I hope this information has been of help. If you have any further questions please do not hesitate to contact us again. I have only tried changing the preincubation step (antibody with blocking peptide) at different amounts of time (so, once overnight at 4 degrees and once for 30 mins at room temperature). The one overnight did help a bit but the bands that should be blocked were still quite bright. To answer you questions: 1) What samples did you use (sample type, species)? I am using lysed keratinocytes infected with HPV 16 2) What antibody dilution have you tried? I have tried many antibody dilutions ranging from 1:200 to 1:10000 and I have found that 1:10000 gives me the best result (no background, but bands of interest still nice and bright). 3) What blocking reagent have you been using? The blocking reagent I use is 5% milk in 1XTBST 4) Which peptide dilutions have you tried? How long did you incubate the antibody with the peptide before the doing the Western blot? For the peptide, I have only tried the suggested amount of 1ug/mL. As stated above, I have tried two different times; 30 minutes at room temperature or overnight at 4degrees. Please let me know if it is obvious that I have missed something here or if I should just try a higher concentration of peptide or perhaps a longer preincubation at room temperature. Thank you for your reply. It seems from your description that you are doing everything fine. If I understand correctly, you are using the peptide at 1 ug/mL and the antibody at 0.1 ug/mL (1/10,000 dilution). At same volumes, the peptide is being used at 10-fold excess. Since this gave only a small effect in blocking, I would suggest trying the peptide at a 100-fold excess. As for the incubation time: if overnight incubation at 4 degree worked a bit better, I would stick with this. Should the increase in peptide not help, please let me know. If the peptide was purchased within the last 6 months, we can discuss options of replacement, credit or refund. I hope this information is helpful to you. Please do not hesitate to contact us if you need any more advice or information. BATCH NUMBER -- NOT SPECIFIED -- ORDER NUMBER -- NOT SPECIFIED -- DESCRIPTION OF THE PROBLEM Non-specific staining SAMPLE human colorectal cancer PRIMARY ANTIBODY ab15086 carbonic anhydrase IX ANTIBODY STORAGE CONDITIONS just bought FIXATION OF SAMPLE formaldehyde ANTIGEN RETRIEVAL citrate HOW MANY TIMES HAVE YOU TRIED THE APPLICATION? 1 HAVE YOU RUN A "NO PRIMARY" CONTROL? Yes ADDITIONAL NOTES I can't answer most ofthe qustions above as I am not the individual who does the specific procedure. But the question is: Using IHC, we are seeing very high staining of muscle. 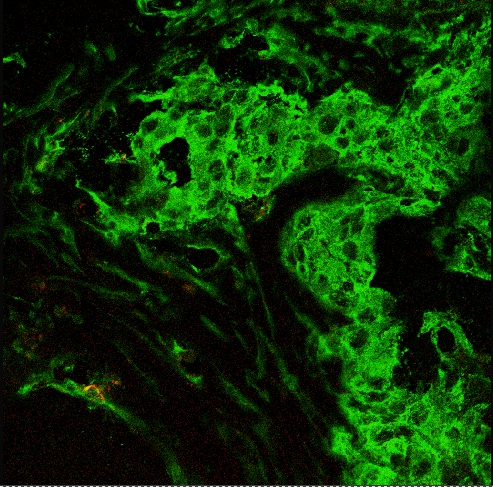 We see the expected membrane staining associated with CAIX staining in a few areas of the tumor, but surmise that the antibody is cross-reacting with something else in muscle. Using identical reagents (but different primary) we do not see any of this staininig. Are you aware of anyone else who has had this problem? I see no comment about it in the literature. All thoughts appreciated. Thank you for your enquiry. I enquired with our source for this antibody and there have not been any reports of this problem where the antibody is staining muscle. 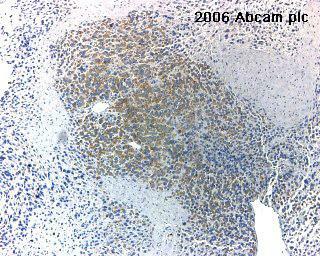 Ab15086 was characterized for use in IHC with renal carcinoma tissue and I would recommend that as a positive control. If you can provide some additional details regarding the protocol that was used, we can further investigate this issue. An image would be helpful as well.